THE Confederation of African Football (Caf) has recommended improvements to Barbourfields Stadium and the National Sports Stadium for the two facilities to meet the continental body's standards before being certified. Caf deputy secretary-general for football and development advised Zifa that the Zimbabwean facilities, inspected at the beginning of the month, have almost similar shortcomings, with the major one being improvement of the pitch. The continental football body inspected the National Sports Stadium, Barbourfields Stadium and Zvishavane's Mandava Stadium. "Pitch condition must be improved and the surface must be green and marked clearly in white. In-field goalposts must be easily removable and spare goalposts must be available for quick installation. The two covered benches should be at pitch level. "For evening matches, the floodlights LUX capacity must be according to the Caf CL match requirements. A minimum 1 200 Lux should be provided all over the pitch, covering uniformly every area of the playing field," wrote Caf in its report about Barbourfields Stadium. Caf also recommended implementation of a uniform signage system around the stadium to facilitate entry or exit of people. It also wants clear adequate signposts to guide spectators to their sectors. "Entry gates, exit gates and doors must be operational and similarly clearly indicated by signs which are universally understood. Installation of stadium specific signage from media entrance to all the various facilities for the media. Installation of signage around the medical facility and throughout the stadium to notify supporters," wrote Caf. 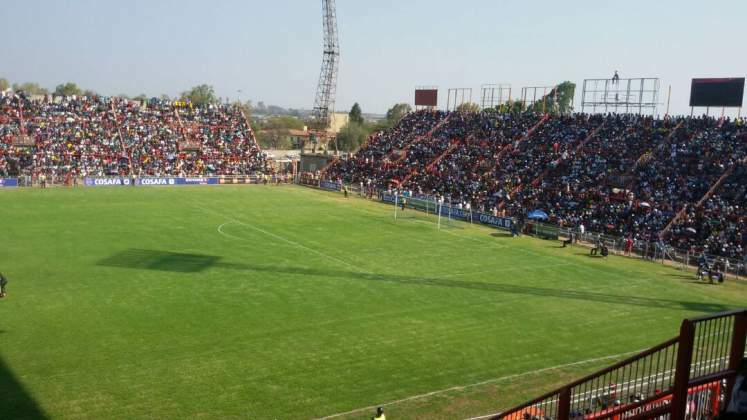 Barbourfields Stadium owners, the Bulawayo City Council, have to add "five individual seated toilets" in the dressing rooms, a massage table in each dressing room, a tactical board (white board/flip chart with pens) as well as good ventilation or air-conditioning. Recommendations were made for a doping room which must be near the teams' dressing rooms and must be "inaccessible to any person that is not involved with the doping control process". The doping room, according to Caf, must be equipped with a television set, a refrigerator equipped with non-alcoholic drinks, sealed mineral water bottles, wastepaper bin for bottles, a ventilator and sufficient seating for at least eight people. The toilet area must be immediately next to the doping control room with direct private access, reads the Caf report. Caf wants numbered bucket seats fixed to the floor at Barbourfields as well as a safety certificate from the concerned authorities in which they will set the permitted capacity for the stadium together with detailed terms and conditions that the stadium management must comply with in order to operate the stadium at its permitted capacity. There have been arguments on the capacity of Barbourfields Stadium and buckets seats will help solve the debate. Besides working on Barbourfields Stadium, the local authority has to channel resources to Luveve Stadium. Last year, the Zifa First Instance Body that inspects the country's stadiums recommended that the local authority expands dressing rooms and provide doping facilities at Luveve Stadium. BCC was also expected to construct a tunnel for players from the dressing rooms and also provide new turnstiles. The cashiers' cubicles at Luveve Stadium are in a sorry state as they have no doors. The Zifa First Instance Body also recommended that the local authority replaces the perimeter fence. Since last year, the only thing the local authority did was to provide segregation of fans' sitting area, separating the rest of the grounds and the VIP wings. With the domestic league season starting on March 30, the local authority has less than a month to attend to the problems identified by the Zifa grounds team.